City Of Brass is ready to leave Early Access after a six month stay. The Arabian Nights-inspired location City Of Brass takes place in, alongside the fact that it lets players wield a bullwhip made it stand out back when it was announced. The first-person rogue-lite adventure, developed by the Bioshock veterans at Uppercut Games, has spent some time in Early Access and is now aiming to release in May. When not slashing away at damned souls, players can use their whips to disarm, trip or stun enemies as well as swing to safety, or manipulate the environment. 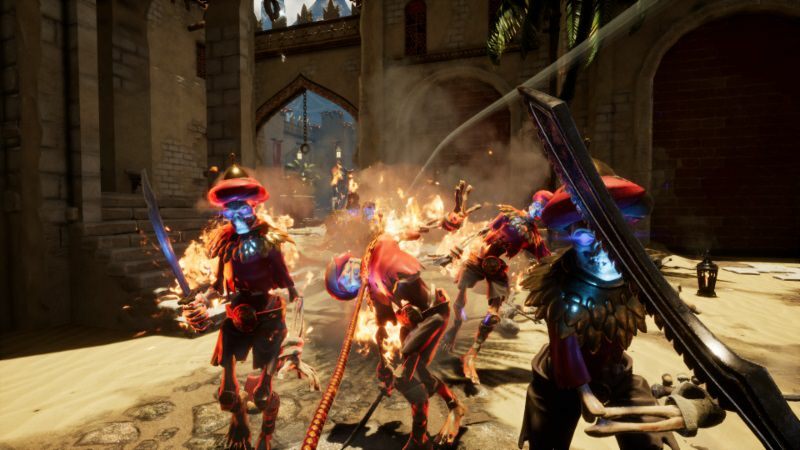 While death will inevitably come knocking, City Of Brass allows for tailoring its difficulty through the Blessings and Burdens system which adds modifiers that change things like player health, damage output and item costs. The system extends to Mixer, where viewers can interact with live-streamers by helping them out with a healing potion, or making things more challenging with additional enemy spawns. City Of Brass is currently available on Steam Early Access, for the price of 22,99€ or your regional equivalent. The title is set to release on the 4th of May on PC, Xbox One and PS4. Give the launch trailer a look.